Many seniors enjoy reading, but changes in health, abilities and finances may make it difficult for them to sit down with a good book as often as they’d like. Though some may be resistant to technology and prefer to stick with print books, others are giving e-books a try. 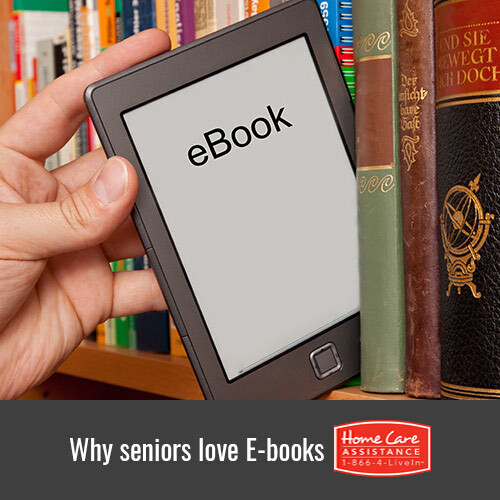 Harrisburg, PA, home care experts discuss 4 reasons why many seniors are choosing eBooks as their preferred reading medium. Most seniors are likely to experience impairments in vision and dexterity at some point. For many, these developments can make reading paper books uncomfortable, painful, or even impossible. E-readers allow seniors to change practically every setting imaginable, including the background colors, the size of the letters, and which buttons can be used to turn pages. Connecting to the days of youth can be incredibly beneficial for seniors. From rediscovering favorite stories to old picture collections, sparking these memories can challenge their cognitive abilities, boost their emotional wellbeing, and even reduce their risk of dementia. Digital books provide seniors with instant access to novels and stories that can take them back to their childhood and teenage years. Many seniors cannot drive to the library every few days or spend hundreds of dollars a year ordering paperback books. In addition to the many inexpensive e-books available, seniors can build a digital library of hundreds or even thousands of free books as well, ranging from modern short stories to classic novels that have become public domain. With just a few clicks of the mouse or a single tap on the screen of their e-reader, your elderly loved one has the ability to download a lot of literature at absolutely no cost. Seniors who have never used an e-reader might be surprised to learn these devices can download much more than traditional literature. Some of the leading magazines and newspapers now offer free or affordable subscription services for digital copies of their articles. Once your loved one is more familiar with this technology, he or she can also search for written music, artwork, old journals, recipes, how-to guides, and much more. Reading regularly is one of the easiest ways for your loved one to keep his or her mind sharp. If your loved one needs more opportunities for mental stimulation, turn to Home Care Assistance. Our revolutionary Cognitive Therapeutics Method focuses on activities designed to boost the brain and delay the onset of dementia. In addition to dementia and Alzheimer’s home care Harrisburg seniors can rely on, we also offer specialized Parkinson’s and post-stroke care. For more information on our in-home care services, call one of our friendly Care Managers today at (717) 540-4663.